Lumencor builds innovative, high-quality light engines that facilitate rapid, sensitive, accurate analysis. Our areas of expertise reside in analytical chemistry, materials science, solid-state physics, optics and engineering. We offer lighting solutions to support the demands of researchers and manufacturers alike. Beaverton, Oregon, (June 18, 2018) -- Lumencor, Inc. is a global leader in the design and manufacture of bright, solid-state lighting for state-of-the-art instrumentation in the life science marketplace. The SOLA family of light engines are established market leaders in terms of brightness, switching speed, stability and long life. SOLA light engines produce white light similar to that of the mercury arc lamp without the heat, electronic and spectral noise and contaminant limitations associated with lamps. Moreover, SOLA light engines overcome traditional LED shortcomings; namely, a lack of optical power and limited spectral coverage. Now Lumencor has further advanced the SOLA light engine product line with the addition of near infrared (nIR) output in the ~735nm spectral region. The new SOLA SE nIR light engines retain all the bright visible-range output customers have come to associate with the SOLA brand. The additional near infrared (nIR) source extends their spectral range and thereby their utility. The new SOLA SE UV-nIR and SOLA SE V-nIR light engines produce powerful outputs based on an array of solid state light sources. The sources turn on and off in unison producing white light that replicates the spectral output traditionally obtained from mercury lamps. The UV output centers on 365 nm and the violet (V) centers on 395 nm. They each efficiently excite nuclear dyes like DAPI and Hoechst. At the other end of the spectrum, a near infrared source at ~735nm now excites Cy7 and ICG. Practically useful levels of near infrared output have never been obtainable from mercury lamps. Moreover, the 500-600nm output of the SOLA light engine, obtained from the application of Lumencor’s proprietary light pipe technology, excites fluors in the visible (VIS) spectral region such as mCherry, TRITC and Texas Red. The unique capacity of Lumencor’s light pipe technology to overcome the inherent green gap, the notorious optical power deficit of traditional LED light sources, was confirmed by a recent patent infringement settlement. 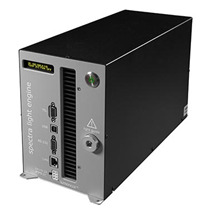 In so doing, Lumencor has preserved the company’s unique value and superior product performance in an environment where lighting is often a critical factor in defining fast instrument throughput, high signal-to-noise ratios and high-resolution imaging. Lumencor is leading the life sciences with light engines for bioanalysis. The company has developed innovative, powerful, pure, stable, durable and cost-effective lighting solutions designed for an array of instruments including ﬂuorescence microscopes. Discrete outputs are available through the UV-Vis-nIR spectrum from a proprietary mix of independently controllable sources. Lumencor’s products provide more power than an arc lamp with the durability, stability, speed and ﬂexibility of a solid-state solution. Lumencor products are available in OEM and off-the-shelf conﬁgurations. For more information, please visit www.lumencor.com. Lumencor’s CELESTA light engine brings together seven individually addressable solid-state lasers with advanced electronic control to yield unprecedented performance. 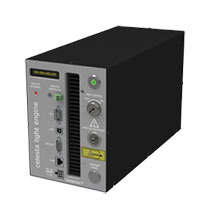 The CELESTA light engine delivers approximately one watt of optical power from each laser (seven watts total) from the distal end of its optical fiber light guide. Long-term output stability is sustained by active stabilization supervised by CELESTA’s onboard computer. Center wavelengths align with the peak absorption of all the key fluors of interest for biotechnology applications. Laser outputs are refined by bandpass filters and merged into a common optical train. Microsecond domain switching times, on/off and between color bands, is enabled by TTL triggering. High brightness, ease-of-use and stability make CELESTA an ideal illumination system for spinning disk confocal microscopy, optogenetics and other high brightness applications. Lumencor’s SOLA light engines are the market leaders in modern solid-state illumination for microscopy and other life science applications. Generating bright, stable and dependable white light, they require no routine maintenance and no consumables. SOLA has rapidly displaced mercury arc lamps and outperforms simpler, traditional LED competitors based on brightness, stability, ease-of-use and switching speed. Now Lumencor has further improved the SOLA light engine product line with the addition of near infrared (nIR) output in the ~735nm spectral region. The NEW SOLA SE nIR light engines retain all the bright visible-range output customers have come to associate with the SOLA brand. The extended near infrared (nIR) output provides additional utility for excitation of fluorophores such as Cy7 and ICG, and for other applications that benefit from the enhanced tissue penetration of nIR light. In Lumencor’s SPECTRA III light engine, eight individually addressable solid-state light sources join forces with advanced electronic control. Constituent light sources include LEDs, lasers and Lumencor’s proprietary luminescent light pipes for outputs spanning UV-VIS-nIR. Each output is refined by a bandpass filter and merged into a common optical train directed to the light output port on the front panel. The built-in liquid light guide (LLG) adapter connects to all major fluorescence microscopes and other bioanalytical instruments. 500 mW per colorband for excitation of DAPI, CFP, FITC, YFP, TRITC, mCherry, Cy5 and Cy7 is delivered from the distal end of the LLG. The SPECTRA III is pre-aligned, service-free and mercury-free. This third generation lighting tool is one of Lumencor’s family of best-in-show illuminators, in terms of brightness, spectral breadth, stability and ease-of-use. OEM and off the shelf configurations are available.